Suppose you have a non-directed graph, represented through its adjacency matrix. How would you discover how many paths of length link any two nodes? 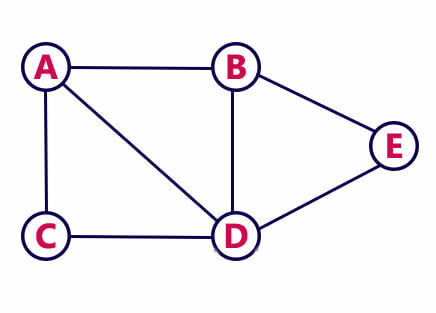 For example, in the graph aside there is one path of length 2 that links nodes A and B (A-D-B). How can this be discovered from its adjacency matrix? It turns out there is a beautiful mathematical way of obtaining this information! Although this is not the way it is used in practice, it is still very nice. In fact, Breadth First Search is used to find paths of any length given a starting node. PROP. holds the number of paths of length from node to node . Back to our original question: how to discover that there is only one path of length 2 between nodes A and B? Just look at the value , which is 1 as expected! Another example: , because there are 3 paths that link B with itself: B-A-B, B-D-B and B-E-B. This will work with any pair of nodes, of course, as well as with any power to get paths of any length. So overall this means that A and B are both linked to the same intermediate node, they share a node in some sense. 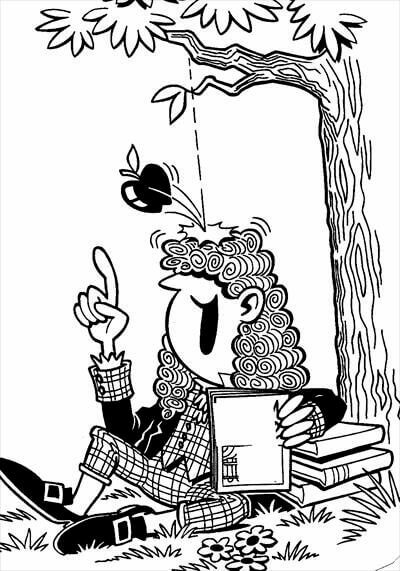 Thus we can go from A to B in two steps: going through their common node. The same intuition will work for longer paths: when two dot products agree on some component, it means that those two nodes are both linked to another common node. For paths of length three, for example, instead of thinking in terms of two nodes, think in terms of paths of length 2 linked to other nodes: when there is a node in common between a 2-path and another node, it means there is a 3-path! Next Next post: Diagonalizing a matrix NOT having full rank, what does it mean?